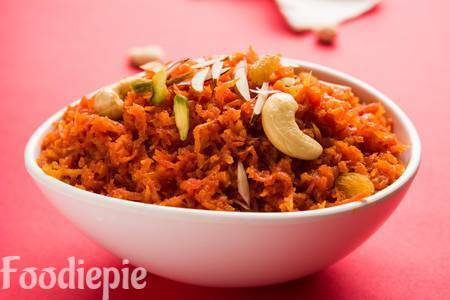 Carrot halwa recipe: It is an Indian dish which is especially preferred in winter. This dish famous all around in India. Everyone wants to eat this dish after dinner or other meal as well.This is also kids friendly dish. you will also see a carrot halwa at the sweet shop and restaurants . You can make it at the festival and special occasions birthday parties as well . So let's make this delicious sweet dish made from grated carrots, sugar, milk and almonds,raisins. which everyone becomes happy after eating. Ingredients for making carrot pudding almost available in every kitchen and this is very easy to make at home in approx 40 minutes. Carrot, milk, green cardamom, ghee, raisins and dates of dates are needed to make a delicious pudding of carrots. Let's checkout recipe first. Step 2 : Heat a non sticky and heat Ghee in pan. Step 3 : Now add grated carrots and roast for 4/5 minutes while mixing continuously. Step 4 : Add milk over roasted carrots and Bring it boil over low flame turns thicker. Step 5 : Cook until mixture turns thicker it will take around for 20 minutes.Stir continuously. Step 6 : When thickness comes in mixture add sugar, chopped cashews,sliced almonds,raisins and cardamoms. Finally : Transfer it to serving bowl Sweet and Delicious Gajar ka halwa is ready.